This Halloween in a Jar project is similar to a Christmas snow globe, although the liquid used in the jar is clear Karo corn syrup. For those in England or other countries that don’t usually use corn syrup, it is a sweet syrup similar in consistency to honey. Although I haven’t tried it, I believe that a heavy sugar syrup, made by stirring sugar in water until it dissolves and thickens, would make a good substitute. 1. Add a layer of marbles to the bottom of the jar. 2. 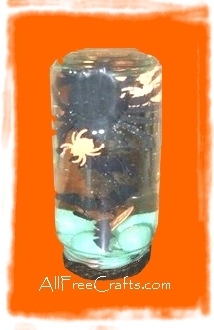 Add the large Halloween figure to the jar. Although it is not necessary, you may want to glue this to the center of the upside down jar lid so that it remains stationary while the other objects float around it. If so, use waterproof silicone caulking (the kind used for fish tanks is excellent) to cement the base of the figure in place. Let dry. 3. Add a selection of Halloween confetti pieces. 4. Pour in clear corn or heavy sugar syrup to fill the jar. If you are adding a figure glued to the lid, remember to allow space for this so the syrup doesn’t overflow. 5. Screw on the lid and invert the jar. If desired, you can run a bead of silicone caulking around the lid to secure it permanently. Activate your Halloween scene by shaking or inverting the jar so you can see the confetti and marbles floating slowly around.